Tetley’s is Leeds. It’s a cracking pint that dates back to 1822 when it was first brewed in Hunslet by Joshua Tetley. Today, it is owned by Carlsberg UK and is the second highest selling ale brand in the world. 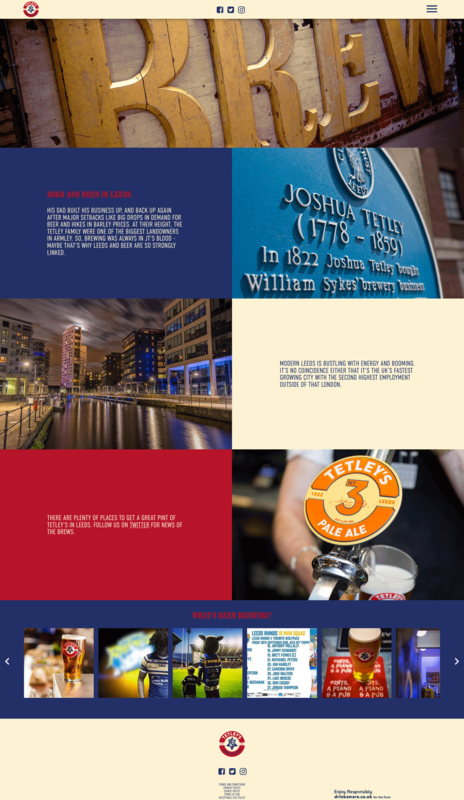 When relaunching the brand with a completely new logo, look and a new ale brewed in Leeds by Leeds Brewery, Tetley’s Brand Manager needed a copywriter on the ground in Leeds who understood the brand, tone of voice and Leeds drinkers. Someone who could ensure that all communications were talking in a way that identified with the man on the street – a ‘Tone of Voice Guardian’. It turned out that copywriter was me, after all, I’m well qualified having lived in Headingley for a decade and knowing ‘The Otley Run’ a little too well. I collaborated in workshops with the client, Leeds design agency WPA Pinfold and London creative communications agency Hue & Cry. Together we formulated a campaign that leveraged Tetley’s heritage and also used a tone of voice that made the brand appeal to a younger market, without alienating their old faithful following. 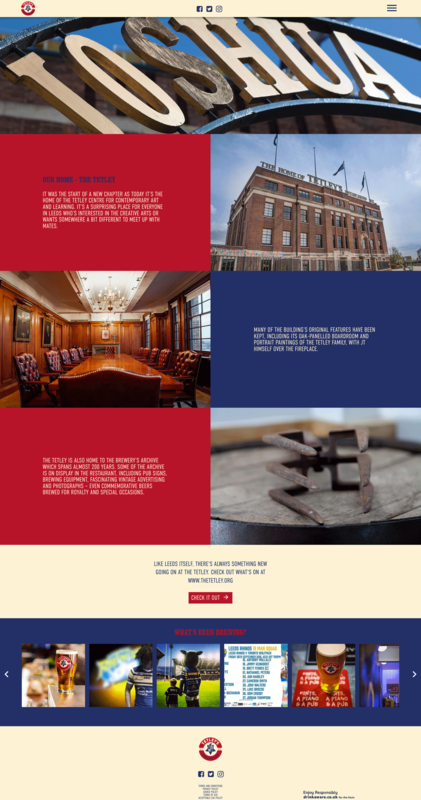 In addition to writing this website, I was also commissioned to shoot at The Tetley and various Yorkshire pubs and clubs that stock their Original Cask, Golden and new No.3 Pale Ales, which you have to try. Many of these shots feature both on the website and across their social media platforms. Check out some highlights from the shoot right here. Hold on a minute. What’s going on? Well, we’ve been doing a tad of renovating at Tetley’s. We thought it was about time seeing as we’ve done a fair bit of innovating too. Keep your hair on, we’ve a new logo and look, but Tetley’s has still got the same timeless taste – we’ve just been busy brewing a new beer. When we say ‘just’, it’s actually pretty damned special and come to think of it, ‘new’ is stretching it a bit. We’ve a confession. Our ‘new’ brew – Tetley’s No.3 Pale Ale – was supped by Joshua Tetley himself. Way back in 1868, Tetley’s was booming and the Head Brewer, George Cross (we haven’t made that up), who was at the brewery 37 years, created Tetley’s Pale Ales. To resurrect the original recipe, we’ve burrowed through our brewery archives and challenged our brewers to bring it back. 1822 was a milestone year, when an ambitious young Joshua Tetley first fired up the Tetley’s brewery. He took what he knew from the family’s malting business, with his motto “Quality Pays” and went for it. JT had noticed there were hardly any proper breweries in the north of England – they were mainly in London. He wasn’t having that. Fast forward through nearly two hundred years of brewing heritage and Tetley’s is still as unmistakably smooth and suppable as it ever was. Leeds has a real ‘can do’ spirit – always has. The Tetley family was no different. William Tetley, Joshua’s dad was a legendary entrepreneur. JT was born on the 20th July 1778 into a family of Leeds maltsters and lived at Armley Lodge. It was the start of a new chapter as today it’s the home of The Tetley centre for contemporary art and learning. It’s a surprising place for everyone in Leeds who’s interested in the creative arts or wants somewhere a bit different to meet up with mates. Many of the building’s original features have been kept, including its oak-panelled boardroom and portrait paintings of the Tetley family, with JT himself over the fireplace. The Tetley is also home to the Brewery’s archive which spans almost 200 years. Some of the archive is on display in the restaurant, including pub signs, brewing equipment, fascinating vintage advertising and photographs – even commemorative beers brewed for royalty and special occasions. Get this, in 1911, Joshua Tetley Challenged Harry Houdini to be handcuffed, chained and escape from a barrel of Tetley’s ale at the Empire Theatre, Leeds. Houdini was teetotal and the barrel, wheeled over by lads from Tetley’s Brewery, was full to the brim. Harry failed to escape, but was rescued. At least you can get on the outside of a Tetley’s right now. Like our new logo? We’ve a confession. It’s actually old, inspired by the original Tetley family coat of arms. What does it all mean? Don’t worry about deep philosophy. All that matters is your pint’s timeless taste. Quality. They say Tetley’s is timeless. The taste is, but making sure every pint’s a belter ain’t easy. In fact, way back in the days before titles like ‘Head of Quality Control’, some lucky staff and Tetley family members would gather in the tasting room at 12 noon on the dot to sample their latest brew. Tough job. They didn’t do it for fun. No, they did it to maintain Tetley’s timeless taste. If it wasn’t reet, it wasn’t released. End of. See your Tetley’s? The yeast culture in it is a double yeast strain (called No.7 and No.9 – don’t ask why). It’s what gives Tetley’s its unique taste. Now here’s the mind-blower…This yeast culture’s been alive since JT fired up his brew kettle in 1822. So, your pint’s almost 200 years old. Get your head and laughing tackle around that.